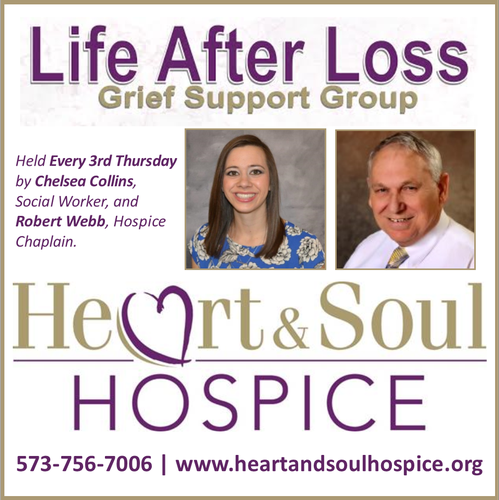 Sponsored by Heart & Soul Hospice, the Life After Loss bereavement support group is a safe place to process grief, learn healthy coping skills and connect with others who are addressing grief issues. You do not have to be a recipient of Heart & Soul services to participate in Life After Loss. This group is open to the public. The Life After Loss bereavement support group meets the third Thursday of every month from 4:30 p.m. to 6:00 p.m. at the Heart and Soul office, 412 Cayce Street in Farmington. An RSVP is encouraged, but not required and can be made by calling 573-756-7066 or emailing farmingtonhospice@pmma.org.